There was a time when there was little in former beauty queen Sue Ellen Ewing's life besides her husband J.R. When his philandering finally got to her, she turned to the bottle, becoming a boozy mess, leading to several trips to the "sanitarium" (Dallas's version of rehab). How times have changed. These days Sue Ellen is an independent woman, in the beginning stages of a Texas gubernatorial campaign, and a devoted mother to John Ross. She hasn't had a drink in years and won't be tempted. 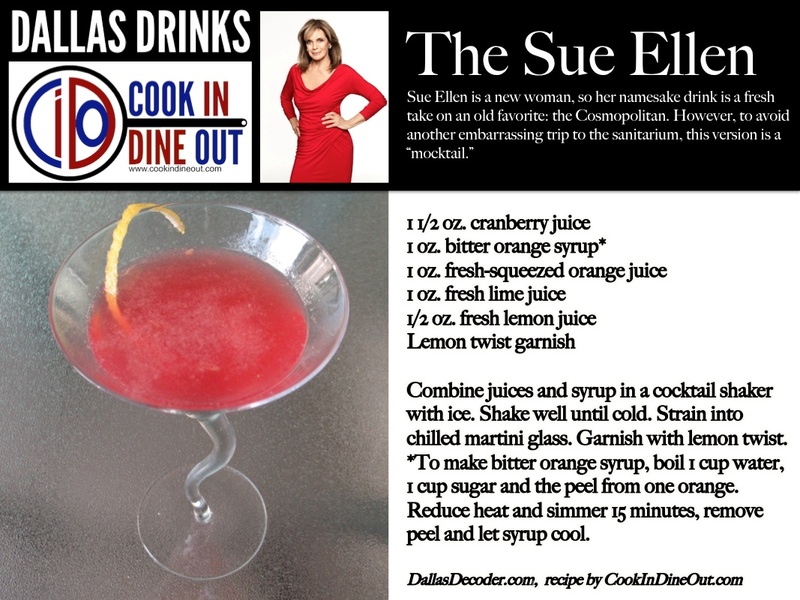 The Sue Ellen cocktail honors her sophistication, femininity and sobriety: a mocktail version of the Cosmopolitan. Another great addition to the "Dallas Drinks" series. Thanks for making this, dear. It got lots of attention when I tweeted it a few weeks ago.